In a nutshell, MIDI is a digital protocol, that is, a language which communicates performance instructions for any musical instrument or device (such as your sound card) which understands the language. 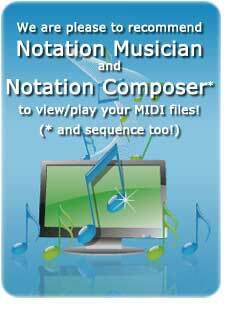 MIDI is not audio information. It is primarily used to communicate which, when, for how long, and how loud to play musical notes, and with which "instrument." But it can be used to communicate a great range of other performance data. Digital pianos, physical pianos and other real instruments, synthesizers, computerized virtual instruments, and even stage sets of an opera can all be controlled by MIDI. It was originally developed in the 1980s as a standard communications protocol for connecting hardware synthesizers together with sequencers, keyboards, and other devices which controlled them. You may start your MIDI discovery by clicking "By Composer", "By Contributor", or typing what you're looking for, into our search box above. To download a MIDI, click its download button, to add it to Download Queue. When you are ready, go to your Download Queue, and follow the download instructions.